Secretary Eliseo Rio of the Department of Information and Communications Technology (DICT) slams the critics of the newly-declared Mislatel for partnering with China as they argued that the third telco should not partner with China having a slower internet speed record worldwide. 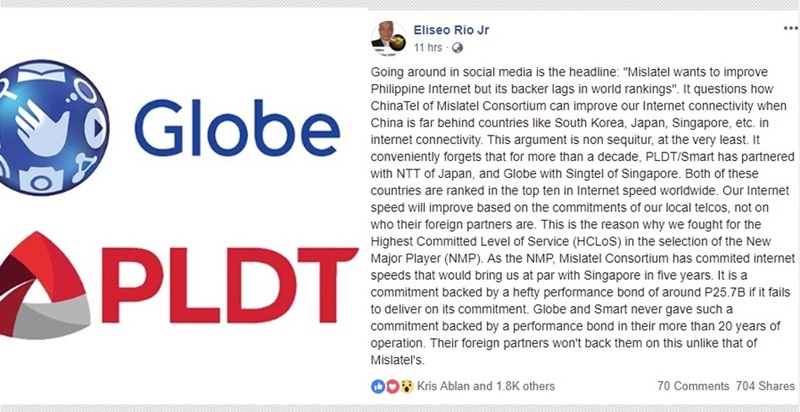 The critics of the third telco in the Philippines suggested that they should partner with Singapore or Japan having faster internet speed but these critics were unaware that Globe and PLDT already partnered with Singapore and Japan respectively. Secretary Eliseo Rio burned down all the critics of the third telco by informing them that PLDT/Smart has partnered with NTT of Japan and Globe with Singtel of Singapore. Both of these countries are ranked in the top 10 in internet speed worldwide but still, the Philippines lags behind our Asian neighbors. According to the DICT Head, the internet speed in the Philippines will improve based on the commitments of our local telcos, not on who their foreign partners are. Going around in social media is the headline: "Mislatel wants to improve Philippine Internet but its backer lags in world rankings". It questions how ChinaTel of Mislatel Consortium can improve our Internet connectivity when China is far behind countries like South Korea, Japan, Singapore, etc. in internet connectivity. This argument is non sequitur, at the very least. It conveniently forgets that for more than a decade, PLDT/Smart has partnered with NTT of Japan, and Globe with Singtel of Singapore. Both of these countries are ranked in the top ten in Internet speed worldwide. Our Internet speed will improve based on the commitments of our local telcos, not on who their foreign partners are. This is the reason why we fought for the Highest Committed Level of Service (HCLoS) in the selection of the New Major Player (NMP). As the NMP, Mislatel Consortium has commited internet speeds that would bring us at par with Singapore in five years. It is a commitment backed by a hefty performance bond of around P25.7B if it fails to deliver on its commitment. Globe and Smart never gave such a commitment backed by a performance bond in their more than 20 years of operation. Their foreign partners won't back them on this unlike that of Mislatel's.